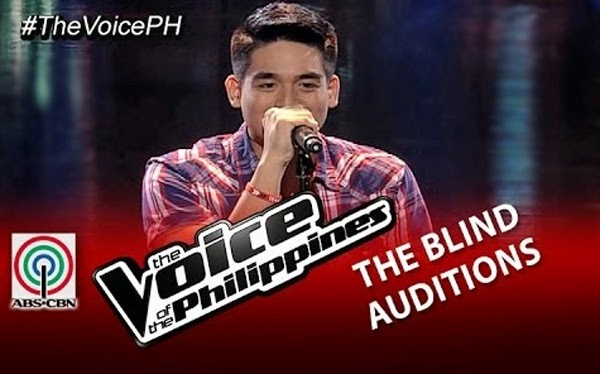 Jem Cubil, a 20-year-old artist from Cebu City was the fourth artist who made it to The Voice of the Philippines Season 2 Blind Audition November 8, 2014. This good looking guy had already experienced joining a reality singing contest called “Pilipinas Got Talent” along with Marcelito. Jem’s inspiration in joining The Voice was his dad who passed away last 2011. With tears on his face, Jem recalled his father’s sacrifices and support on him. In return, Jem dedicated all his performances, including his gigs to his noble father. Jem usually prays during before his performance and does the sign of the cross to ask for guidance and protection from God. He considered joining The Voice a great opportunity for him and he said he will do his best. He performed the song “Use Somebody” and upon hearing the first part of the song, Coach APL turned his chair instantly followed by Coach Lea. Coach Lea was struck by his good looks and she was impressing something to Coach Sarah in order to turn her chair also. Despite of this, Coach Sarah and Bamboo did not turn their chairs. Coach Sarah said that the reason why she did not turn her chair was because she was looking for something that will strike her heart. Coach Bamboo said that that song was one of his favorite and he said that he was so connected with the original. On the other hand, the two coaches who turned their chairs convinced him to be part of their team. Coach APL said admitted that Jem’s performance was not perfect and that’s why he was into perfection. The other coach who turned her chair, Coach Lea said that what she liked the most out of Jem’s performance was the connection. In the end, Jem chose Coach Lea.